Napa Valley or Sonoma County? 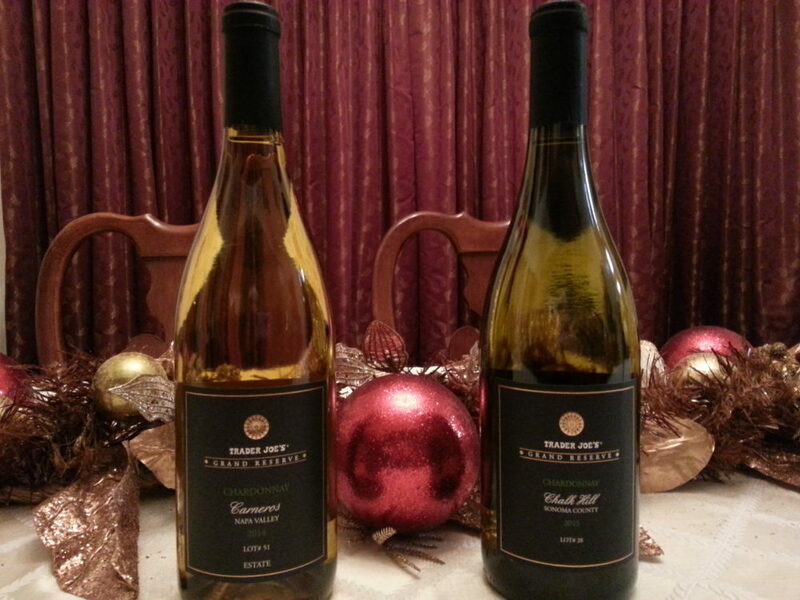 As 2016 comes to a close, we are wrapping up a fun and delicious year of wine tasting with two California chardonnays. The nose on this wine has slight toasty oak and vanilla notes. It is light in color and has a polished and balanced acidity. I am tasting layers of citrus zest and pear, with a butterscotch flavor in the finish. The wine is 15.1% in alcohol. This wine is also light in color, but the nose opens with a subtle fragrance of honeysuckle. Although the bouquet is subtle, the flavors of the wine, coconut, pear, and vanilla come through nicely. It has a soft, smooth finish and is 14.5% in alcohol. 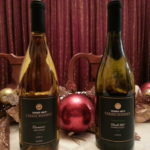 The Napa wine is more flavorful and pronounced while the Chalk Hill wine is softer, more subtle all the way around. I’m normally a lover of Chalk Hill, but this time I think I prefer the Carneros wine. At just $12.99 a bottle, I’m definitely headed back to Trader Joes to round out my New Year’s Eve wine selection. Thank you for following us in 2016. We are looking forward to much more tasting, even heading to Australia to enjoy the delicious chardonnays from the Barossa wine region. So stay tuned. Come back and visit us often. Wishing you the best in 2017! Happy New Year! We’ve traversed Sonoma, tried wines from Napa, sampled many Yolo chardonnays, dipped down into Arroyo Seco and even hopscotched over to Argentina, but I don’t think we’ve covered any El Dorado wines yet. 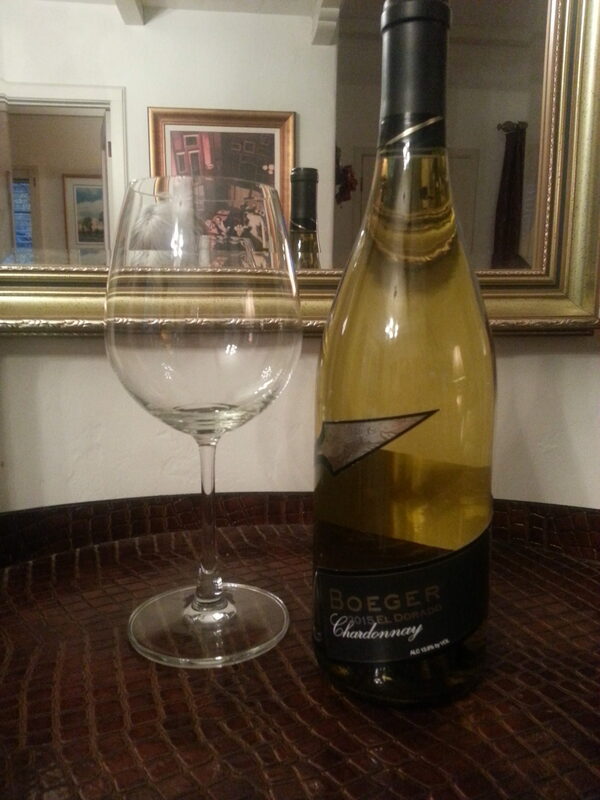 Today we are trying the Boeger 2015 El Dorado Chardonnay, a recent gift from my darling friend, Rebecca. This is not a creamy or full-bodied wine but leans more towards a light-bodied wine with a soft finish. It has a polished style. I taste layers of pear and apricot with hints of citrus. Luscious vanilla bean and honeysuckle notes are in the bouquet. 100% malolactic fermentation, 30% French oak and lees stirring contribute to make this an easy drinking wine. I love the notes in the nose and think that is my favorite part of this wine. At just $16 a bottle, I like it!